Trumba® calendars are interactive. This means that site visitors can take actions with your calendar and the events they find there. For example, they can add events to their personal calendars or arrange to be notified if the time or location of an event changes. These types of actions build ongoing connections between you and your site visitors, and increase the likelihood that they'll attend your events. With Trumba Connect there are several ways to give your site visitors control over the events they see on your website calendar. When they have control, they're more likely to find and attend the events they care about. Important For these steps, and throughout the Get Started articles, we use examples from the default General Events calendar generated by the Trumba Startup Wizard, and assume that you've completed the previous Get Started articles. General Events has its own set of views and custom fields, which may differ from those on your default calendar, but you can still work with the steps below. Review the views and filters available on your default published calendar that allow site visitors to control which events they see and how the events are presented. For more information, go to the section Review the spuds that drive your hosted calendar, in Get Started 3.
Review the Table, List, Month, and 3 Columns views to see each impacts how easily you can find the events you're interested in. For information about other ways to give your site visitors control, go to Control and Promotion Spuds. See how event actions (built in to every Trumba calendar) make it easy for your calendar visitors to add events to their calendars, set reminders, arrange to be notified if events change, and more. Select an event by clicking the checkbox next to its title. For more information about your default calendar, go to Get Started 1: Review your live calendar and Trumba editing environment. Click the Add to My Calendar button at the top of the calendar. The Event Actions window opens with the Add to My Calendar event action selected (as shown in the following screenshot, captured from the sample calendar we created when we ran the wizard for these articles). To add the selected event to your personal calendar, select the personal calendar program that you use (e.g. Outlook), and then follow the on-screen instructions. In the Event Actions list, select Email Me Event Updates (highlighted in the screenshot above). Type your name and email address, and then click Submit. In the Event Actions list, click Text Reminder. Type your mobile phone number. Select the time from the drop-down menu when you wish to have a reminder sent, and then click Submit. To receive an email reminder, click Email Reminder. Close the Event Actions window. Word of mouth remains one of the best ways to spread information about your events. We'll show you two ways that Trumba calendars make it easy for site visitors to share information about your events with others. To help you explore your options, we've provided links to other live calendars. One of the event actions that's automatically available on all Trumba calendars is to share an event over social media. On the University of Utah events calendar, for example, click the title of an event that takes place in the future. At the bottom left of the event detail page that opens, click either the Facebook, Twitter, or LinkedIn icon. After you comment on the event and click Share, you see the event (with an image, if there is one) posted to your feed. Tip You can also let calendar visitors comment on events using the Disqus commenting service or the Facebook comments plug in. Learn more. Another of the event actions that's automatically available on all Trumba calendars is the ability to forward it to friends. On the University of Washington events calendar, click the title of an event that takes place in the future. At the bottom of the event actions window, click Forward to Friends. In the event actions window, type your name and email address. Type the email addresses of up to ten other people. Type a message if you want, and then click Send Email. You'll see confirmation that email messages were sent. 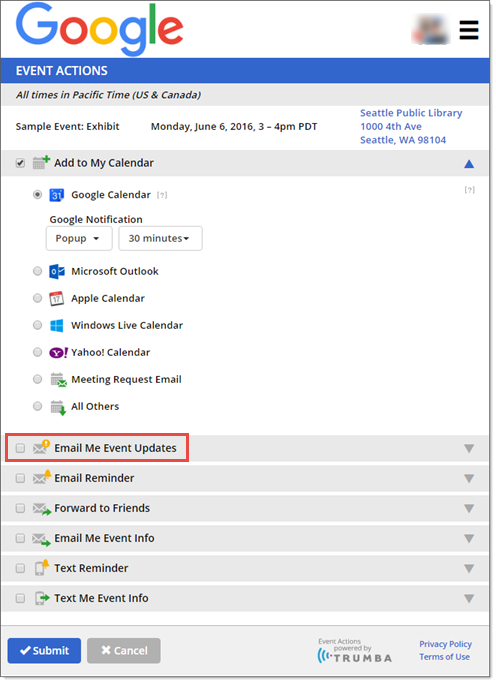 By clicking the icon to the right of the event title, recipients can add the event to their personal calendars, forward it to more friends, and take other event actions. You can't expect your site visitors to keep returning to your website to see if you've added any new events to your calendar. If you're a Trumba calendar publisher, you automatically provide site visitors with easy ways to stay informed about upcoming events. Note When site visitors want to stay informed about changes to a particular event, they can use event actions (e.g. Email Me Updates). To stay informed about all the events in the publication, they can subscribe to the calendar email, such as in the procedure below. Customers who visit your calendar can add themselves to that email distribution list with just a click. For more information, go to Get Started 4: Scheduled calendar email. Click Subscribe just above the calendar. On the page that opens, select Weekly email, and then type your name and email address. Click Subscribe. Tip To subscribe to an RSS feed of your website calendar, click RSS Feed and then follow the on-screen instructions. When you add or update events, RSS subscribers automatically receive notification in their browsers or RSS readers. For more information, go to http://en.wikipedia.org/wiki/News_aggregator. Close the window and return to your hosted calendar. You'll now begin receiving a weekly email message containing upcoming events from your calendar. To stop receiving the email messages, click the Opt Out link at the bottom of any message. When your customers can add your events to their own calendars, and automatically receive information about upcoming events, they are more likely to stay connected with your organization. Site visitors can submit events to help develop your website calendar. You can track customer interactions with your calendars and events. If it makes sense for your organization, you can add an event submission form to your website so that site visitors can submit their own events. You control the destination calendar for submitted events and can set up an approval process prior to events going live. You can submit a test event to the Trumba University demo website to receive an example email confirmation. (We won't actually add any submitted events to the calendar; and, submitter information is never shared with any outside parties.) For more information, go to The Event Submission Process. Go to the Trumba University demo calendar. Fill out (at least) the required fields. You'll see a summary of your event information. If you click Submit, both you and the calendar publisher receive email notification that the event has been submitted. Trumba Connect provides up-to-date, detailed reports about how often site visitors view your calendar, which events are most popular, what actions they take with events, and more. We provide you with a Publisher Dashboard where you can view your calendar activity. While you're not likely to see much activity on the initial calendar generated by the Trumba Startup Wizard, you can at least see where to track activity in the future. At the top right corner of the window, click Publisher Dashboard. The Dashboard lists the calendars in your account and provides summary statistics for each published calendar's activity for the past three months. For example, this partial calendar views chart appears in a very active calendar's Dashboard. Click Return to yourcalendarname to return to the editing environment.